Most of us want to do our part in making the world a cleaner, greener place for the next generation. However there is a misconception that “going green” is only for an elite group of people with extra time and money. This simply isn’t true and I’m here to tell you that a lot of environmentally-friendly habits are not only easy, but will actually save you tons of money over time! I’ll be the first to tell you that gardening can be costly, but if you’re intentional about keeping things simple and not investing in tons of special tools it can save you a lots of money. Plus, it’s fresh, locally grown and (hopefully) organic making it a win for the environment. Anytime you cook something from scratch instead of buying it prepackaged you’re saving money AND one time use packaging from being used and discarded. I have a ton of from scratch recipes for you to check out below. Also, you can look through my Recipe Index for more great recipes. Eating at home saves you money and creates less waste because you’re skipping the one time use cups, utensils and other packaging. If you struggle in this area be sure to check out 6 Tips to Avoid Eating Out. Did you know that Americans throw out an estimated 1/3 of their food? That’s like carrying six bags of groceries to your car and always leaving two in the parking lot to rot. A couple of things you can do to reduce food waste are meal planning, eating leftovers and keeping a running inventory of what needs to be eaten soon on your fridge. Also, if you know you aren’t going to be using something try to find someone who might want it instead of throwing it out. I’ve created a list of 20 Creative Ways to Use Kitchen Scraps for more ideas. Another great way to use kitchen scraps and save money on expensive fertilizer or soil amendments is to compost. If you don’t have enough land to do your own composting then see if there is a local composting program near you. Some cities or apartment buildings will collect food waste for making compost. Line or air drying clothes is a great energy saver and will save you money. Every time you use your electric dryer instead of air drying you’re using energy and reducing the life of your clothes. You know all that lint that you clean out of the lint trap? Those are small bits and pieces of your clothes, meaning they will wear out faster and you will have to spend more money on replacing them more often. For every disposable paper product out there, you can replace it with a more sustainable and inexpensive cloth alternative. Use dish rags instead of paper towels, cloth napkins instead of paper, cloth shopping bags instead of plastic, cloth diapers instead of disposable, reusable sanitary pads or menstrual cups instead of paper feminine products. The list goes on and on. Making your own products is fun, healthy, frugal and environmentally-friendly. I use vinegar, water and baking soda for almost all of my cleaning. Also, I make my own laundry detergent which saves me money and plastic packaging. Check out this list of 30 Items you Can Make at Home to Save Money for more ideas. While a lot of people talk about recycling, it really should be one of our last lines of defense for reducing waste. Refusing to use something such as a plastic bag or reducing the amount of things that we do use should come before recycling. The next time you run out of a product, evaluate whether you really need it or if you can make it yourself at home before buying it again. Shopping at thrift stores, consignment sales and garage sales are awesome ways to save money and also keep used items from going to the landfill. I try to buy as much as possible (especially kids clothes and books) used. You have to be picky when buying used so you don’t end up with a bunch of junk that you don’t need. We live in such a consumeristic culture that people don’t even think about going without something. If they need it they buy it end of story. They don’t even consider whether they could simply go without it. Like I said above, the next time you run out of an item evaluate whether you really need it or can make it yourself at home. Buying in bulk saves money and packaging. Plus, if you bring your own cloth bags or jars and shop in the bulk section at your local grocery store then you’re saving on most or all packaging which is a win in my book. If you live in an urban area where you can walk or ride your bike instead of driving or taking public transportation then by all means do it!! 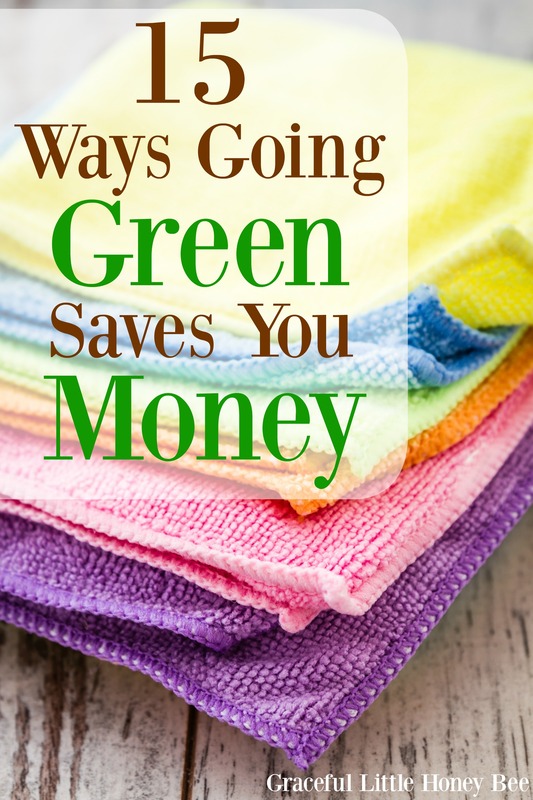 It’s not only frugal and environmentally friendly, but also great for your health. I live in a very rural area so this isn’t possible for me, but if I lived in the city I would definitely hoof it everywhere that I could. Going on long far away trips are fun and have there place in life, but they’re also expensive and create lots of carbon emissions. Choose to stay home and explore your local community when you can. I bet you could find all kinds of things in your area that you’ve never done before or usually take for granted. Sometimes the best trips are the simple ones such as camping, swimming or hiking. Another great way to save money and create less waste is to fix something when it breaks instead of throwing it away. Make do and mend means to make do with what you have instead of buying something new. Way too many people in our throw away culture don’t even consider fixing something when it breaks which is a crying shame. Which of these habits do you practice? I’d love to know!